Last year, with only a month of notice, a small group passionate people announced we’d like to do an international open data hackathon and invited the world to participate. We were thinking small but fun. Maybe 5 or 6 cities. In the end people from over 75 cities around the world offered to host an event. Better still we definitively heard from people in over 40. It was an exciting day. Last week, after locating a few of the city organizers email addresses, I asked them if we should do it again. Every one of them came back and said: yes. So it is official. This time we have 2 months notice. December 3rd will be Open Data Day. I want to be clear, our goal isn’t to be bigger this year. That might be nice if it happens. But maybe we’ll only have 6-7 cities. I don’t know. What I do want is for people to have fun, to learn, and to engage those who are still wrestling with the opportunities around open data. There is a world of possibilities out there. Can we seize on some of them? First off. We’ve got more data. Thanks to more and more enlightened governments in more and more places, there’s a greater amount of data to play with. Whether it is Switzerland, Kenya, or Chicago there’s never been more data available to use. Second, we’ve got better tools. With a number of governments using Socrata there are more API’s out there for us to leverage. Scrapperwiki has gotten better and new tools like Buzzdata, TheDataHub and Google’s Fusion Tables are emerging every day. And finally, there is growing interest in making “openess” a core part of how we measure governments. Open data has a role to play in driving this debate. Done right, we could make the first Saturday in December “Open Data Day.” A chance to explain, demo and invite to play, the policy makers, citizens, businesses and non-profits who don’t yet understand the potential. Let’s raise the world’s data literacy and have some fun. I can’t think of a better way than with another global open data hackathon – an maker’s fair like opportunity for people to celebrate open data by creating visualizations, writing up analyses, building apps or doing what ever they want with data. The basic premises for the event would be simple, relying on 5 basic principles. 1. Together. It can be as big or as small, as long or as short, as you’d like it, but we’ll be doing it together on Saturday, December 3rd, 2011. 2. It should be open. Around the world I’ve seen hackathons filled with different types of people, exchanging ideas, trying out new technologies and starting new projects. Let’s be open to new ideas and new people. Chris Thorpe in the UK has done amazing work getting young and diverse group hacking. I love Nat Torkington’s words on the subject. Our movement is stronger when it is broader. 3. Anyone can organize a local event. If you are keen help organize one in your city and/or just participate add your name to the relevant city on this wiki page. Where ever possible, try to keep it to one per city, let’s build some community and get new people together. Which city or cities you share with is up to you as it how you do it. But let’s share. 4. You can work on anything that involves open data. That could be a local or global app, a visualization, proposing a standard for common data sets, scraping data from a government website to make it available for others in buzzdata. It would be great to have a few projects people can work on around the world – building stuff that is core infrastructure to future projects. That’s why I’m hoping someone in each country will create a local version of MySociety’s Mapit web service for their country. It will give us one common project, and raise the profile of a great organization and a great project. We also hope to be working with Random Hacks of Kindness, who’ve always been so supportive, ideally supplying data that they will need to run their applications. 5. Let’s share ideas across cities on the day. Each city’s hackathon should do at least one demo, brainstorm, proposal, or anything that it shares in an interactive way with at members of a hackathon in at least one other city. This could be via video stream, skype, by chat… anything but let’s get to know one another and share the cool projects or ideas we are hacking on. There are some significant challenges to making this work: timezones, languages, culture, technology… but who cares, we are problem solvers, let’s figure out a way to make it work. Like last year, let’s not try to boil the ocean. Let’s have a bunch of events, where people care enough to organize them, and try to link them together with a simple short connection/presentation.Above all let’s raise some awareness, build something and have some fun. 1. If you are interested, sign up on the wiki. We’ll move to something more substantive once we have the numbers. 2. Reach out and connect with others in your city on the wiki. Start thinking about the logistics. And be inclusive. Someone new shows up, let them help too. 3. Share with me your thoughts. What’s got you excited about it? If you love this idea, let me know, and blog/tweet/status update about it. Conversely, tell me what’s wrong with any or all of the above. What’s got you worried? I want to feel positive about this, but I also want to know how we can make it better. 4. Localization. If there is bandwidth locally, I’d love for people to translate this blog post and repost it locally. (let me know as I’ll try cross posting it here, or at least link to it). It is important that this not be an english language only event. 5. If people want a place to chat with other about this, feel free to post comments below. Also the Open Knowledge Foundation’s Open Data Day mailing list will be the place where people can share news and help one another out. Once again, I hope this will sound like fun to a few committed people. Let me know what you think. This entry was posted in cool links, free culture, open data and tagged apps, data, free culture, hackathon, mozilla, okfn, open data, opendata on October 11, 2011 by David Eaves. I’ve been doing a lot of thinking about access to information, and am working on a longer analysis, but in the short term I wanted to share two graphs – graphs that outline why Access to Information (Freedom of Information in the United States) is unsustainable and will, eventually, need to be radically rethought. First, this analysis is made possible by the enormous generosity of the Canadian Federal Information Commissioners Office which several weeks ago sent me a tremendous amount of useful data regarding access to information requests over the past 15 years at the Treasury Board Secretariat (TBS). 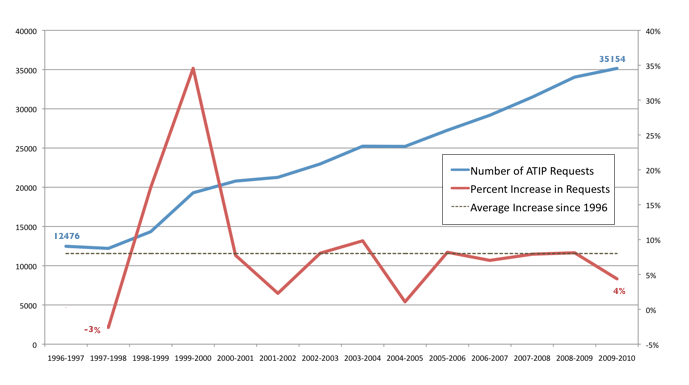 The first figure I created shows both the absolute number of Access to Information Requests (ATIP) since 1996 as well as the running year on year percentage increase. The dotted line represents the average percentage increase over this time. As you can see the number of ATIP requests has almost tripled in this time period. This is very significant growth – the kind you’d want to see in a well run company. Alas, for those processing ATIP requests, I suspect it represents a significant headache. That’s because, of course, such growth is likely unmanageable. It might be manageable if say, the costs of handling each requests was dropping rapidly. If such efficiencies were being wrestled out of the system of routing and sorting requests then we could simply ignore the chart above. Sadly, as the next chart I created demonstrates this is not the case. 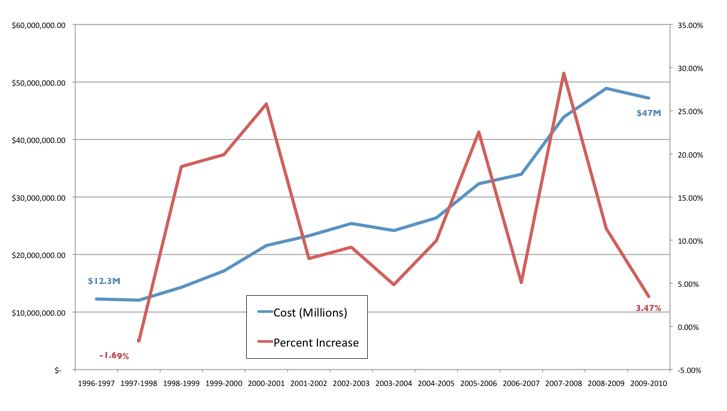 In fact the costs of managing these transactions has not tripled. It has more than quadrupled. This means that not only are the number of transactions increasing at about 8% a year, the cost of fulfilling each of those transactions is itself rising at a rate above inflation. Now remember, I’m not event talking about the effectiveness of ATIP. I’m not talking about how quickly requests are turned around (as the Information Commissioner has discussed, it is broadly getting worse) nor am I discussing less information is being restricted (it’s not, things are getting worse). These are important – and difficult to assess – metrics. I am, instead, merely looking at the economics of ATIP and the situation looks grim. Basically two interrelated problems threaten the current system. 1) As the number of ATIP requests increase, the manpower required to answer them also appears to be increasing. At some point the hours required to fulfill all requests sent to a ministry will equal the total hours of manpower at that ministry’s disposal. Yes that day may be far off, but they day where it hits some meaningful percentage – say 1%, 3% or 5% of total hours worked at Treasury Board, may not be that far off. That’s a significant drag on efficiency. I recall talking to a foreign service officer who mentioned that during the Afghan prisoner scandal an entire department of foreign service officers – some 60 people in all – were working full time on assessing access to information requests. That’s an enormous amount of time, energy and money. 2) Even more problematic than the number of work hours is the cost. According to the data I received, Access to Information requests costs The Treasury Board $47,196,030 last year. Yes, that’s 47 with a “million” behind it. And remember, this is just one ministry. Multiply that by 25 (let’s pretend that’s the number of ministries, there are actually many more, but I’m trying to be really conservative with my assumptions) and it means last year the government may have spent over $1.175 Billion fulfilling ATIP requests. That is a staggering number. And its growing. Transparency, apparently, is very, very expensive. At some point, it risks becoming too expensive. Indeed, ATIP reminds me of healthcare. It’s completely unsustainable, and absolutely necessary. To be clear, I’m not saying we should get rid of ATIP. That, I believe, to be folly. It is and remains a powerful tool for holding government accountable. Nor do I believe that requesters should pay for ATIP requests as a way to offset costs (like BC Ferries does) – this creates a barrier that punishes the most marginalized and threatened, while enabling only the wealthy or well financed to hold government accountable. I do think it suggests that governments need to radical rethink how manage ATIP. More importantly I think it suggests that government needs to rethink how it manages information. Open data, digital documents are all part of a strategy that, I hope, can lighten the load. I’ve also felt that if/as government’s move their work onto online platforms like GCPEDIA, we should simply make non-classified pages open to the public on something like a 5 year timeline. This could also help reduce requests. I’ve more ideas, but at its core we need a system rethink. ATIP is broken. You may not know it yet, but it is. The question is, what are we going to do before it peels off the cliff? Can we invent something new and better in time? This entry was posted in canadian politics, free culture, open data, public policy, technology and tagged ATIP, cdnpoli, free culture, government, opendata, technology on March 30, 2011 by David Eaves. This TEDx talk by Johanna Blakley is pure gold (thank you Jonathan Brun for passing it along). It’s a wonderful dissection – all while using the fashion industry as a case study – of how patents and licenses are not only unnecessary for innovation but can actually impede it. What I found particularly fascinating is Johanna’s claim that long ago the US courts decided that clothing was “too utilitarian” to have copyright and patents applied to it. Of course, we could say that of a number of industries today – the software industry coming to mind right off the bat (can anyone imagine a world without software?). The presentation seems to confirm another thought I’ve held – weaker copyright and patents protections do not reduce or eliminate peoples incentive to innovate. Quite the opposite. It both liberates innovation and increases its rate as others are able to copy and reuse one another. In addition, it makes brands stronger, not weaker. In a world where anybody can copy anybody, innovation and the capacity to execute matters. Indeed, it is the only thing that matters. It would be nice if, here in Canada, the Ministers of Heritage (James Moore) and Industry (Tony Clement) would watch and learn from this video – and the feedback they received from ordinary Canadians. If we want industries as vibrant and profitable as the fashion industry, it may require us to think a little differently about copyright reform. This entry was posted in canadian politics, free culture, public policy and tagged cdnpoli, copyright, free culture, public policy on March 1, 2011 by David Eaves. For those interested – or better still, up till now uninterested – in Canada’s digital economy strategy I wanted to write a quick post about some things you can do to help ensure the country moves in the right direction. Improved access to publicly-funded data – I’m actually on the fence on this one. I agree that data from publicly funded research should be made available, however, this is not open government data and I fear that the government will adopt this recommendation and then claim that is does “open data” as the UK and the US. This option would, in fact, be something far, far short of such a claim. Indeed, the first option above is broader and encompasses this recommendation. Second, go read Michael Geist’s piece Opening Up Canada’s Digital Economy Strategy. It is bang on and I hope to write something shortly that builds upon it. Finally, and this is on a completely different tack, but if you are up for “clicking your mouse for change,” please also consider joining the facebook group I recently created that encourages people to opt out of receiving the yellow pages. It gives instructions what to do and, the more people who join bigger a message it sends to Yellow Pages – and the people that advertise in them – that this wasteful medium is no longer of interest to consumers (and never gets used anyways). This entry was posted in commentary, cool links, free culture and tagged commentary, cool links, digital economy strategy, free culture, yellow pages on June 17, 2010 by David Eaves.